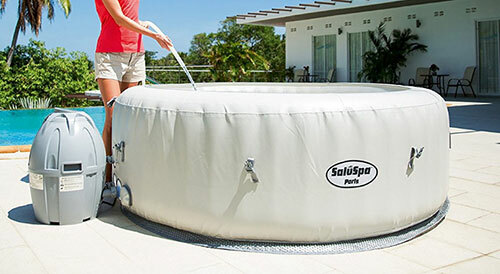 Portable inflatable hot tub will bring you relaxing luxury of a spa to your own backyard, patio, deck or wherever you go. The inflatable tub is portable, easy to install, easy to pack away and simple to unwind at any time. Whether it’s a for two people or six-person inflatable hot tub party, the best one that fits your budget, meets your needs and holds up through repeated use. The design usually consists of an inflatable tub made of PVC or vinyl, as well as an external combination pump and heater unit that controls both water temperature and jets. 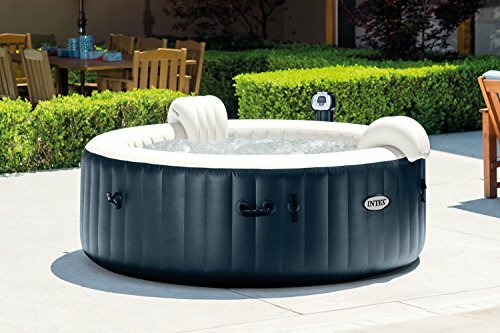 The best inflatable hot tub can generally be set up in 20 minutes and filled from a garden hose. Most of them can also heat water. Even though the basics are similar across models, there are some key factors to consider in your buying decision. Best Inflatable Hot Tub – What To Look For? Layered vinyl or PVC is standard for inflatable tubs. Many models also have reinforced walls of the tub with fabrics like polyester or nylon. Intex calls its unique blend of materials Fiber-Tech, while Coleman uses the name Tri Tech 3 Layer Material for its mix of polyester mesh and layered PVC. The design and structure of the tub is just as important as the materials used to make it. Many manufacturers use a segmented inflatable design, reinforced with a vertical I-beam structure inside. These internal vinyl panels make for a sturdier tub, one that can support users leaning against it or even sitting directly on the outer wall of the spa. 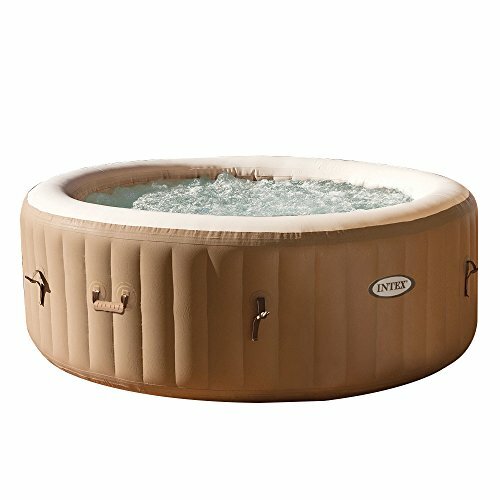 More premium portable hot tubs add another level of stability and protection with interlocking panels that surround the inflatable tub. 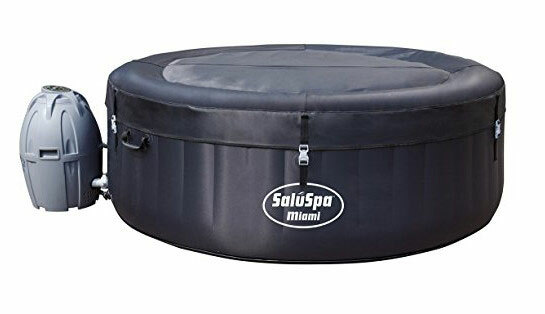 All inflatable spa tubs include a top cover. Some also use the cover to insulate the tub when it’s not in use and speed the heating process. Some models include inflatable covers that fit into the top of the tub like a stopper in a bottle, while others use insulating materials like foam or foil lining to keep the heat inside. 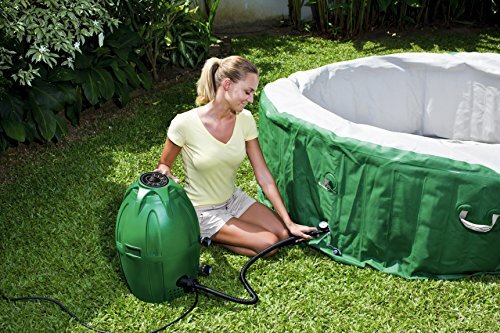 There are all sorts of accessories available for maintaining your portable jacuzzi. Any portable hot tub you consider should include the basic filter cartridges necessary for use. Even better, if they come with an extra filter or two. If you plan to leave the tub filled for days or weeks you will also want one that includes chemicals like chlorine or bromine. Dispenser and test strips to monitor the pH levels of the water would also be welcomed. This is detailed review / instructional video on an Intex inflatable hot tub / spa. Other accessories manufacturers offer to include are ground mat to protect the bottom of the tub, built-in water softening, and built-in or attachable seat cushions and cup holders. Inflatable hot tubs are built to be portable and inexpensive. Many manufacturers cover the pump and heater with a 12-month warranty, but only cover the tub pool with a 30- to 90-day warranty. Look for a tub that has a longer warranty period on the tub pool and has clear means of reaching customer service representatives. With proper care and maintenance, an inflatable hot tub can last for years. Which is Best Inflatable Hot Tub? 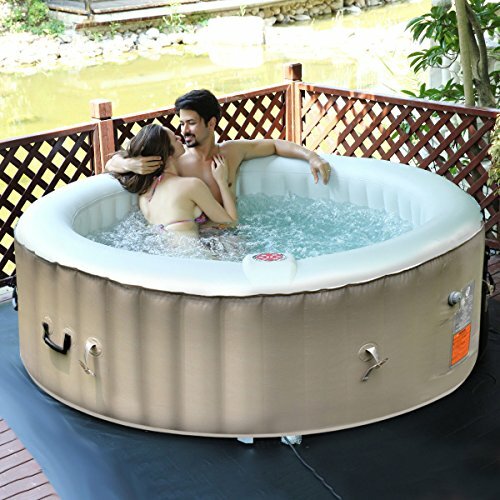 While it is hard to say which is best and cheap inflatable hot tub, based on user reviews and price we have separate few worthy models to consider when purchasing and choosing the right portable spa. 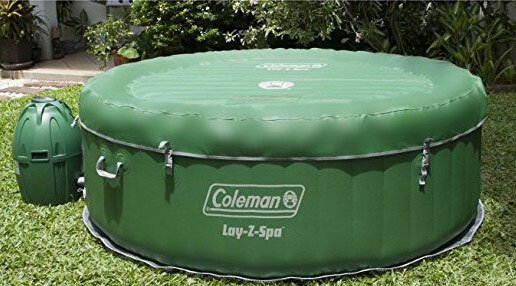 The Coleman Lay-Z Spa inflates in just a couple of minutes, and can just as quickly deflate and fold down to a compact size for storage or transport. It features an automatic start and stop timer, so it can be heated up and ready when you need. It also has puncture-resistant exterior, buckle-down top to keep out debris and retains air for a long time. 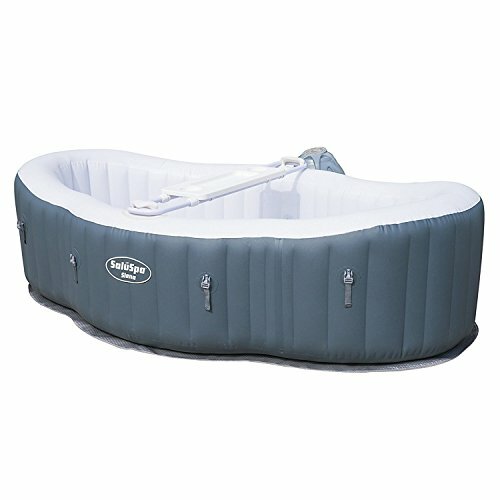 Coleman inflatable tub includes integrated water filtration system and can fit 4 to 6 adults. Water capacity is 254 gallons and maximum temperature can be up to 104º F. It also comes with digital control panel and is constructed from sturdy I-beam and leatheroid exterior. 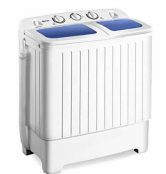 For a relatively affordable option that’s easy to deflate and store, consider the Intex PureSpa 28403E. 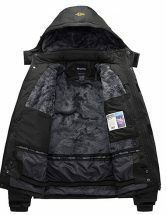 It has an insulated cover that prevents heat loss when you plan to leave it filled and that provides added safety when there are pets or kids around. This inflatable hot tub has built-in hard water treatment system but takes a long time to heat up. This is more than just an inflatable hot tub, it is a bubble massager too. Other inflatable hot tubs do have the bubble jet features but the Intex one does it better. 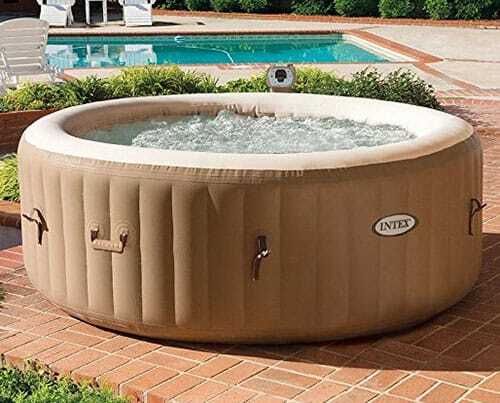 The Intex PureSpa portable hot tub is also available in round and octagonal designs. You can choose between a regular massage spa set, deluxe massage spa set, and jet and massage spa set. 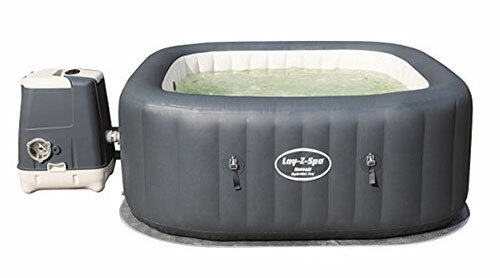 The Bestway SaluSpa Lay-Z-Spa Miami has a 177-gallon water capacity that can easily accommodate up to four people. Its rapid heating system will get your spa hot and ready for you in just a few minutes and will top out at 104 degrees. 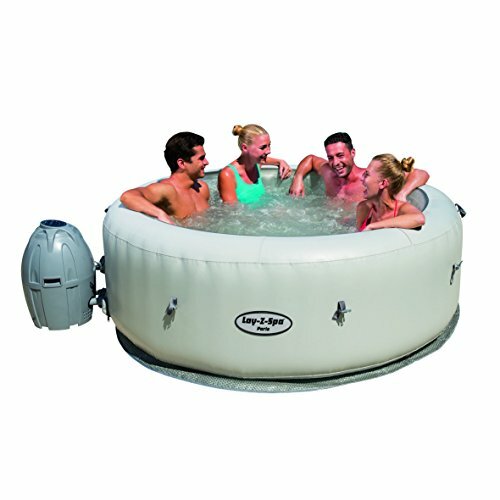 Bestway’s Lay-Z-Spa Miami Inflatable Hot Tub can be considered the best 4 people hot tub if you based it on cost. 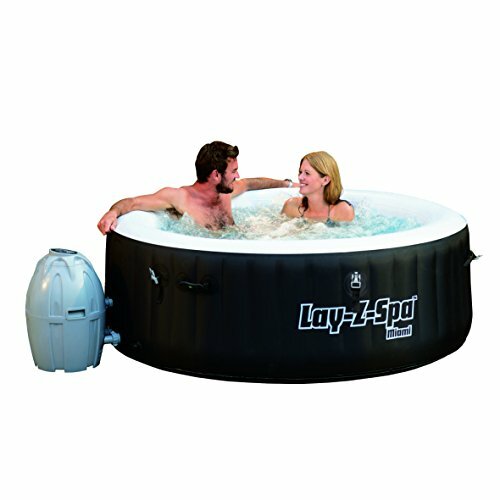 The Lay-Z-Spa inflatable is also available in a bigger 6-person hot tub capacity, namely the Palm Springs and Paris models. Relax with up to three of your adult friends in the 71-inch wide, 26-inch deep Bestway Lay-Z-Spa Paris. It features a built-in massage system, a seven-color LED lighting effect and comes up to temperature quickly, so you can hop right in with less waiting. You will not need any tools for installation and it can be used indoors or outdoors. The Lay-Z-Spa Paris includes a remote control LED strip that cycles through 7 colors for a relaxing and soothing effect. This tub features a separate air pad cushioned floor which sits underneath the spa. On top of the additional comfort under foot and backside, this helps with insulation and minimizing the loss of heat through the base of the spa. 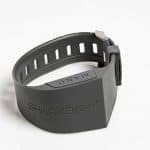 Comes supplied with a leatheroid cover with double safety lock clips to help keep unwanted debris from getting in the water. The Bestway Lay-Z-Spa Hawaii HydroJet Pro may be expensive, but it’s worth every penny. It features two side handles that make it easy to lift and reposition when empty of water. It also features eight adjustable HydroJets as well as soothing bubble jets for whatever mood you are in. The Lay-Z-Spa Hawaii has a built-in saltwater system as well as a hard water treatment system. It comes with Digital Control Panel with an automatic Start/Stop timer-controlled heating system. The exterior is made with a TriTech 3-ply reinforced material, featuring a polyester mesh core encased in two layers of PVC, for extra strength and durability. The Intex PureSpa 28419E is an inflatable hot tub doubling as a pool that seats 4 -6 people. The water temperature can range from 68-104 degrees and can be controlled with the electronic module. The massage bubble jets will soothe your muscles and the hard water treatment is gentle on your skin. This set also comes with 2 inflatable benches for maximum comfort. The inflatable design of the PureSpa makes it easy to set up without sacrificing durability. The walls are covered in 3-ply laminated material and is resistant to punctures. The Fiber-Tech construction makes the spa walls sturdy to sit or lean on, but still plush. Here are some advantages of using inflatable hot tub. Not everyone can afford to have a hard hot tub built inside their homes or in patios. Built-in best hot tubs can cost upwards $2,000. An inflatable hot tub is an affordable alternative while still experiencing the same features that a regular hot tub can do. One of the major advantages of an inflatable hot tub is its portability. It can be set up in your backyard during summer months or rolled up and stored away during winter months. 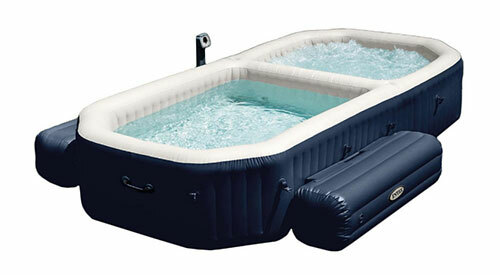 Most inflatable hot tubs will come with air pumps that will allow you to inflate and deflate within a few minutes. This portability also means that you can take the device on vacations and it can also be easily disassembled if you are moving houses. People who have back problems report a decrease in back pain after a few minutes soak in their own inflatable hot tubs. The water in the hot tub and the jet bubbles produced helps massage and relax your back muscles. As with most products inflatable hot tubs also have their disadvantages. An inflatable spa takes quite long to heat up. The average increase in temperature is about 2 to 3 degrees Fahrenheit per hour. This means you need to estimate one day for heating before using your spa unless you prefer cold water. The cost of heating your inflatable spa depends if you are using it inside, or outside, and how often do you use it. Portable spas used outside tend to lose heat quicker than those inside. Inflatable hot tubs do not usually have built-in seating. This means you do not have the advantage of regular hot tubs where you can sit back and relax. You usually sit on the bottom of the inflatable hot tub which has cushioning. Many people, though, prefer a raised seat. Almost everyone loves to relax and soak in a bubbly, hot bath. 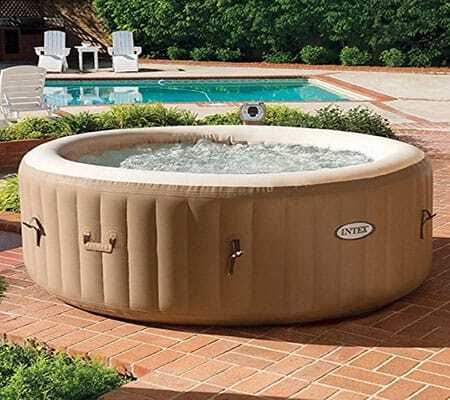 The portable hot tubs offer easier maintenance and storage options. They can be deflated and stored away at your convenience. They are also available for whenever you wish to enjoy the benefits of a traditional hot tub but without the maintenance hassles and high cost.